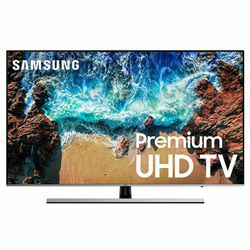 I’d like to share the results of the test Samsung 50NU7100 vs 49NU8000 to compare two Samsung models of series NU71100 and NU8000 respectively. Both TVs hit the market in 2018, but 49NU8000 is pricier than 50NU7100, although they belong to the middle price range. Samsung 50NU7100 has the brand PureColor tech to enlarge the number of color shades. Its Motion Rate 120 provides a high-quality picture on fast-moving content. Clean Cable Solution eliminates plenty of cords but permits to use a single cable integrated with One Connect Box. Samsung 49NU8000 has the HDR elite tech to widen the range of brightness and Ultra Slim Array for intelligent lightning to make dark scenes darker and light scenes lighter. The test Samsung 49NU8000 vs 50NU7100 revealed their great picture quality and versatility – both units are great for watching various content (movies, sports) and gaming due to low input lag and no motion blur. They can also be used as a monitor. Despite the lack of local dimming, they demonstrate deep black and perfect contrast. Samsung 49NU8000 supports FreeSync to improve response time while gaming. Both units upscale non-4K videos that’s important because the majority of content is still not in 4K. 49NU8000’s sound is average that’s why a soundbar is recommended. Its viewing angle is decent enough to sit at a far angle and to lose just a bit of picture quality. 50NU7100’s sound is great and the clarity of voices is exceptional, but it requires a sound bar when performing in a large room. Both TVs are flat and large with a difference in their stands – 49NU8000 with one central stand versus 50NU7100 with two side stands with a silver finish that looks like in the high-end models. 49NU8000 has a very thin bezel that looks great whether the TV is on the wall or not. Both TVs have the textured finish on the back. 50NU7100’s borders are thicker than 49NU8000’s ones (0.55” versus 0.35” respectively). Can be used instead DVR to record – just plug in a flash drive and set up the TV for time recording. SmartThings app has no text input and app launching possibilities, so it can’t replace the remote completely. Steam Link app to connect the comp with the TV without installing Steam Link hardware on the PC to play games. 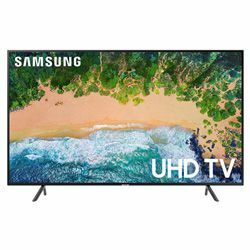 It takes some time to figure out the TV and HDMI port connection to get HDR, especially when it deals with Apple 4K TVs.